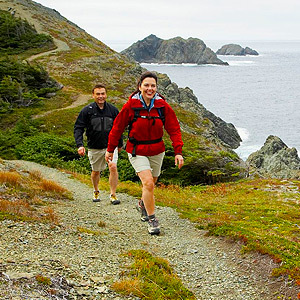 Twillingate has spectacular walking trails along the coastline, across the cliffs with spectacular ocean views. In season, an iceberg may be waiting around any corner! Readers' Digest lists our trails as one of the 10 best in Canada! Book your guided Hiking Tour of Twillingate today. Hikes provide the opportunity to pick blueberries, partridgeberries or bake apples when in season. Be prepared for wind and fog and have proper clothing, good hiking shoes and water. View the hiking map in PDF format to see where the Twillingate hiking trails are. From root cellars, geocaching and other hidden gems, your hiking adventures are never dull in Twillingate.